Pop. 92. In Kincardine T., Bruce C. on C. Rds. 1 & 15,34 km. S of Port Elgin. In 1862 Scottish settlers named their community after Macbeth's Glamis Castle in Forfarshire, Scotland. Pop. 796. In Bruce and Kincardine Ts., Bruce C., on Hwy 21 and C. Rd. 15, 67 km. NE of Goderich.
. In Kincardine T., Bruce C. on Hwy 9, 13 km. SE of Kincardine. Scots settled here in 1849 and in 1853 named their post office after Inverbervie, a coastal town in Kincardineshire, Scotland. Pop. 451. In Bruce T.,Bruce c., on L. Huron at the mouth of the Little Sauble R. and C. Rd. 15, 15 km. NE of Kincardine. Pop. 60. In Huron T., Bruce C., on L. Huron at the mouth of the South Pine R, on C. Rd. 23, 16 km SW of Kincardine. Pop. 41. In Bruce C. on Hwy 21 and C. Rd. 6, 10 km. SW of Kincardine. A cheese factory is located here. The community was named for a stand of pine trees. In Lindsay T., Bruce C. on L. Huron and C. Rd. 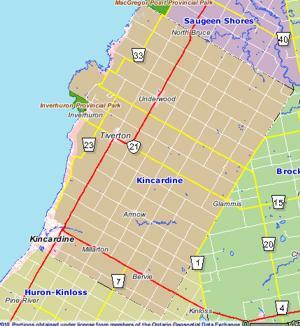 23, N of Stokes Bay, S of Ira L. and 15 km SW of Kincardine. First called Clarke's Corners Or Clark's Corners.